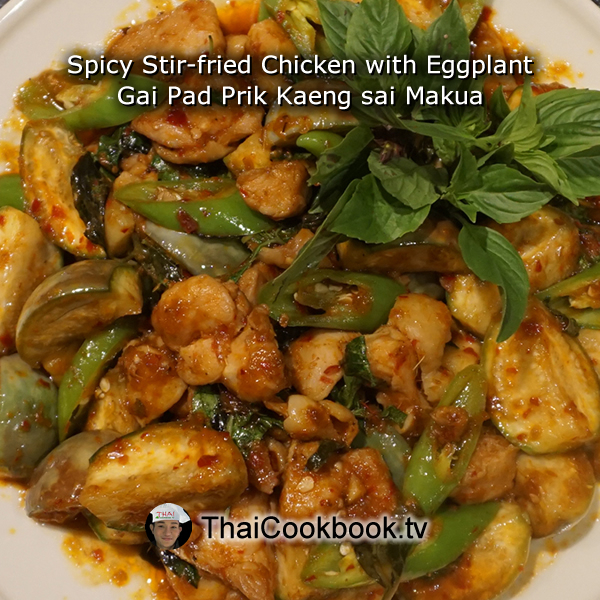 This quick and easy stir-fried chicken dish with Thai eggplant and red chili paste is one the most popular dishes at the restaurant. We use the meat from a nice big chicken leg, but you can use the same recipe to make it with chicken breast, pork, or even beef. Serve with a nice helping of delicious Thai Jasmine rice on the side for a satisfying plate lunch or as part of a meal with other foods. 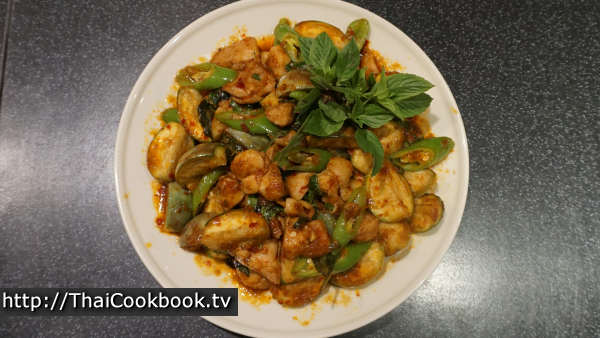 What's in our Spicy Stir-fried Chicken with Eggplant. 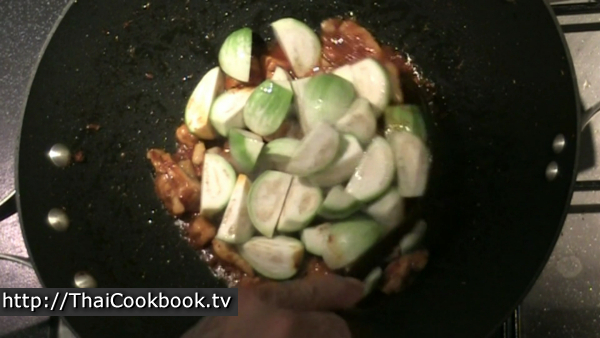 How we make our Spicy Stir-fried Chicken with Eggplant. 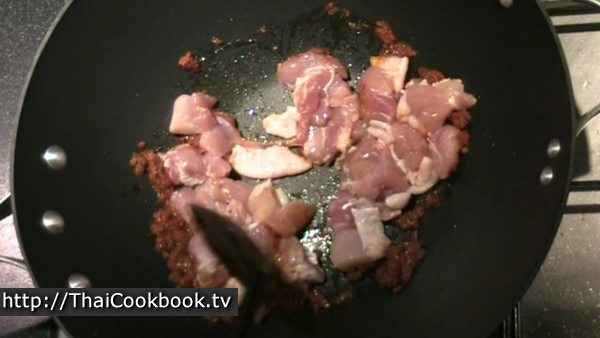 1) Remove the skin and bone from the chicken leg and cut the meat into pieces. 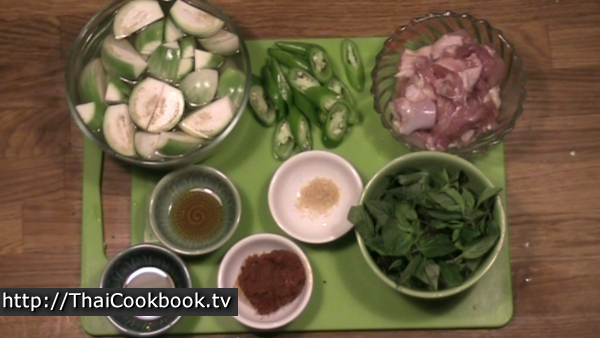 Cut the eggplant and chili, and pluck the basil leaves. 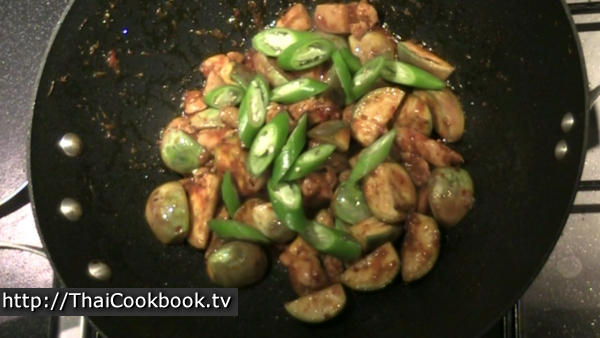 2) Fry the chicken meat with the red chili until done, then cook with the eggplant for about 3 - 4 minutes. 3) Add the mild green chili, cook for one minute, then turn off the heat. Toss in the basil and serve immediately. Remove the skin and bone from a large chicken leg, and cut the meat into chunky bit-sized pieces. We use the round Thai eggplant, but you can use any type of firm eggplant for this dish and it comes out great. 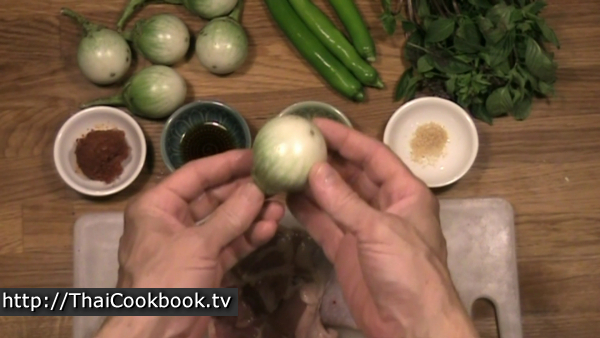 We cut the eggplant into quarters, then soak it in a bowl of water with 2 teaspoons of salt. The salt will help the eggplant retain a bright green color. Like with all our spicy chili paste dishes, we use the type of basil we call Horapah. It is the one known as Star of Siam or Thai Sweet Basil, and has a distinct aroma and flavor like licorice or anise. Be sure you are using the right one for the correct flavor. Pluck the leaves and purple flower tops to get about 1 cup or more. 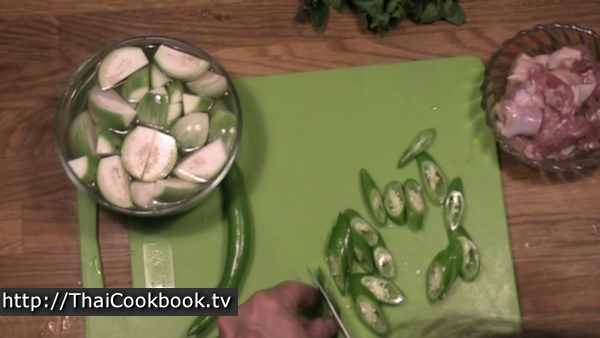 Slice the mild green chili on a diagonal. This dish cooks up fast, so have everything measured and ready before you start frying. 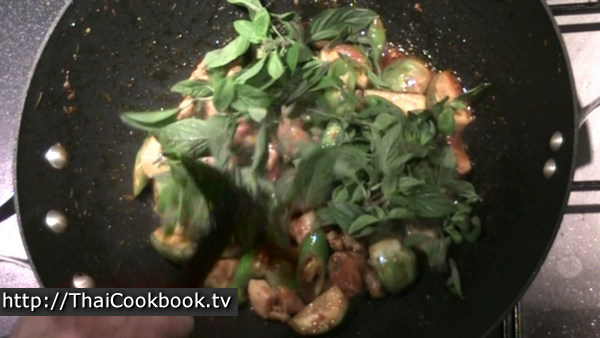 Heat about 1 Tablespoon of oil in a wok or frying pan over low heat. Add the red curry paste and fry it slowly until smooth and creamy. Keep the heat low so it doesn't burn. Turn the heat up to medium high. 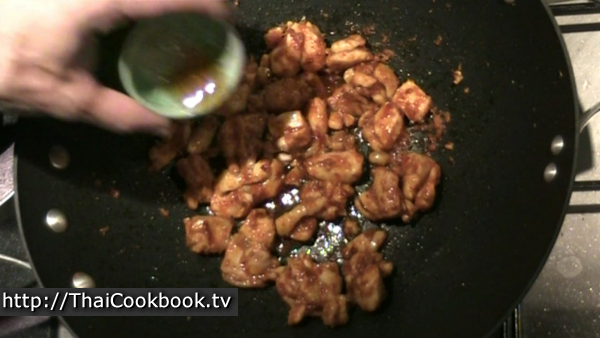 Add the chicken meat and fry it in the chili until completely cooked, stirring constantly. 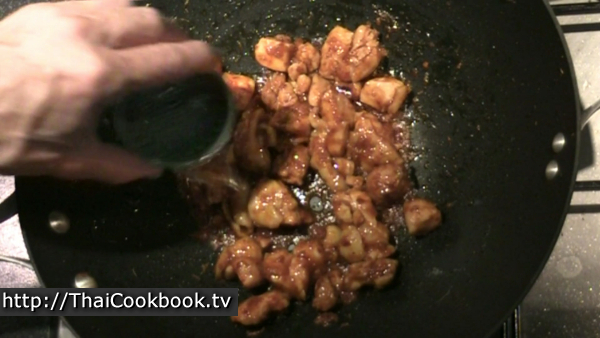 When the chili and chicken are dry and sticking to the pan a little, add the sauces and sugar. Stir it all up and cook until the sugar melts and you have just a little sauce. Add about 2 Tablespoons of water and stir it all up well. Let it get hot and smooth as you continue frying. Drain the salt water from the eggplant and rinse it well under clean water. Add it to the chili and chicken mixture, stir it all up, and fry for about 3 - 4 minutes or until the eggplant starts to soften. Keep stirring, and add small amounts of water as needed to keep it from getting dry. You want the finished dish to have a nice sauce, not be dry and stiff. Add the green chili and continue stir frying for about a minute. Turn off the heat and stir in the basil. Let it wilt in the residual heat as the pan cools. Serve while very hot with some steamed Thai Jasmine rice. Garnish with some fresh basil tops.